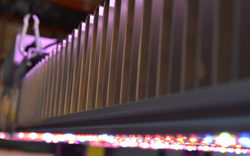 Illumitex, the Digital Horticulture company, announces the HarvestEdge horticulture LED grow lighting modular system. The HarvestEdge is designed for greenhouse supplemental and indoor primary grow lighting applications. When configured for supplemental greenhouse lighting with the high performance F3 spectrum (25% blue, 5% green, 75% photored) the system delivers nearly 30% more efficiency than competitive products. While Illumitex’s unique thermal-fin design maximizes performance, it also enables a low-cost solution that delivers 20% more light for the same dollar. The aesthetically pleasing fixture is light weight, thin, easy to install, has integrated power, and comes with wet, IP67, ETL, and cETL certifications depending on modules. It will be available for pre-sale June 11, 2018.